Ex marks the spot: Beth Hylton (left) and Paul Todaro play former spouses in Private Lives at Pittsburgh Irish & Classical Theatre. Since we never met, it seems unfair to place this onus on him -- but I'm convinced that one reason I'm so screwed up is because of Noel Coward. With his world-weary sophistication, razor-sharp wit and piss-elegant style as a blueprint, I spent a lot of years (and annoyed a lot of friends) trying to be just like him. As a little kid, I thought that being an adult meant being Noel Coward. Unfortunately for me (and you), I neglected to emulate his talent as well. Writer, director, composer and performer, Coward was the first showman of the 20th century. And perhaps more than anything else he did, his play Private Lives cemented the term "Cowardesque" in the language. 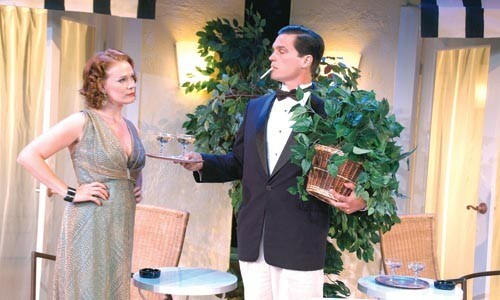 The quintessential Coward comedy, Private Lives concerns Elyot and Amanda Chase: once married but now divorced owing to their hot-blooded tempers. They've remarried and, as misfortune would have it, are spending their honeymoons in neighboring hotel rooms. They soon realize that their attraction is very much alive and have to solve the problem of their new spouses ... as well as the fact that they can't spend five minutes together without wanting to kill each other. Not the deepest of plays, certainly, and while Coward makes a few superficial nods to weightier issues, Private Lives is really just an excuse for Coward to do what he did better than anybody -- stylized characters and gloriously pointed prose, all set down just to make you laugh and laugh. And, really, I can't imagine a finer opportunity for you to see Coward at his best than this pristine production from Pittsburgh Irish & Classical Theatre. Thanks to the immaculate, nuanced and achingly precise direction of Jeffrey M. Cordell, this Private Lives seems as natural as breathing and as funny as ... well, don't get me started on how funny. I may have grown up trying to be Noel Coward, but this director and cast have succeeded ... and then some.